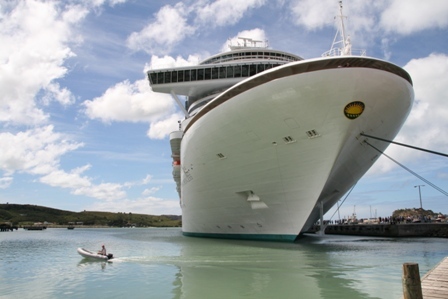 A Caribbean Cruise – an experience of a lifetime. However it was with some trepidation that we embarked on this part of our trip. This opportunity arose at Christmas time, and as we had no fixed agenda after the ski course we decided to take advantage and go sail. The trepidation was due to the fact that Cathal and I both suffer sea sickness, and each of our previous maritime sailing experiences have been marred by it somewhat! 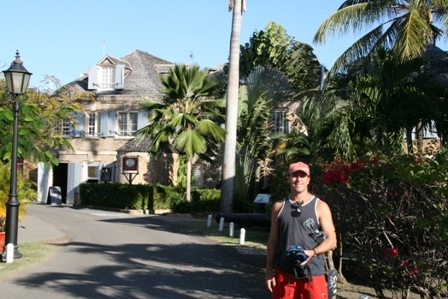 We arrived in St John’s, Antigua, on 26 February. 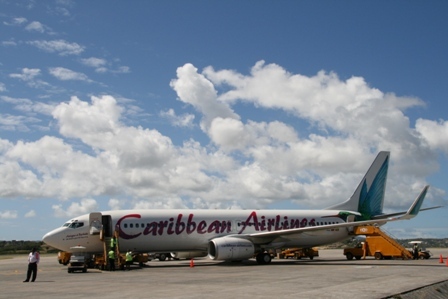 Our flight took us through Trinidad and Barbados – rather a long way around! What greeted us was 26 degrees and a strong wind. The latter has made me rather nervous considering we are about to embark on a sailing trip! 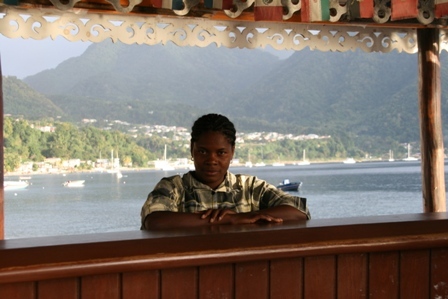 Antigua’s population is primarily of African origin. There are also many Rastafarians around with rather big hair. The vibe is what I would term “Africa-Lite” – lots of the trademarks of African people but with no mudhuts or traditional clothing or hassle. Packed minibuses abound, tradespeople sell unidentifiable fruits in small bags on the street, and corncobs are roasted on the pavement. Most other visitors we have observed are either off cruise ships or the odd windblown sailor. We visited a beach yesterday, traveling by the aforementioned minibus. 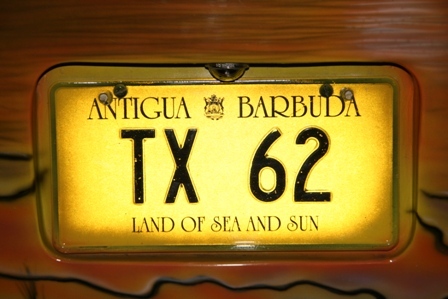 Antigua is famous for its beaches, the best of which are upmarket resorts. 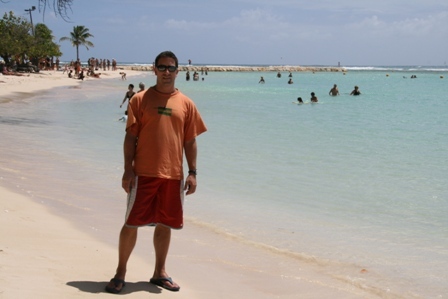 However with 365 white sand beaches, there is enough to go around! We met Paddy Barry, Cathals Dad, on the 28th. 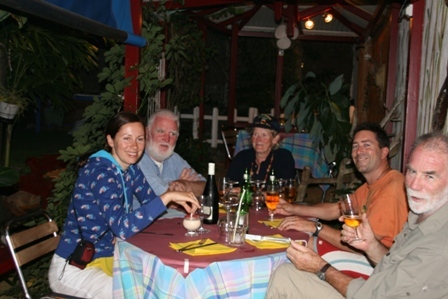 A reunion dinner at Hemingways restaurant proved very amiable, and early the next morning we took a flight to Martinique, to meet the boat Northabout and the rest of the crew. 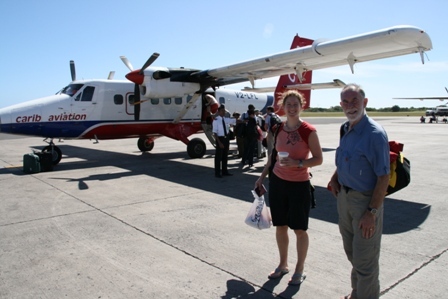 We travelled with LIAT airlines, otherwise known as ‘Leave Island Any Time’, or ‘Luggage in any town’. 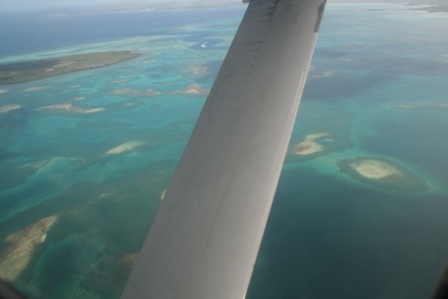 We hopped our way down the islands in a 20 seater plane to Fort-de-France in Martinique. We easily located the boat in the harbour, and Paddy swam out to greet them. On board was Jarlath Cunnane, owner and skipper; Anne Donoghue from Westport; and Donagh and Monika from Rosmoney. All are very keen sailors and were delighted to see us arrive, so that they could get on the move again! 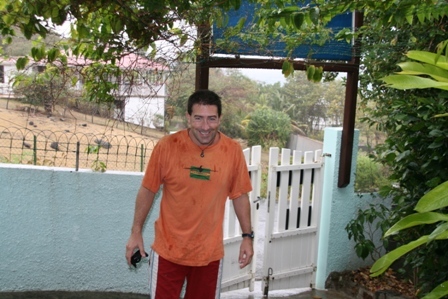 We set out almost immediately for St Pierre, a small town on the north coast of Martinique. 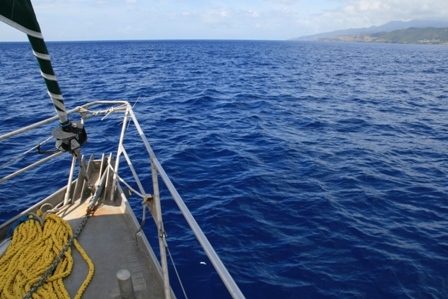 It was a pleasant sail in the sun – no illness yet! We arrived and anchored in time for sundowners on deck. Martinique is a French island, suddenly we were saying bonjour and using euro again! 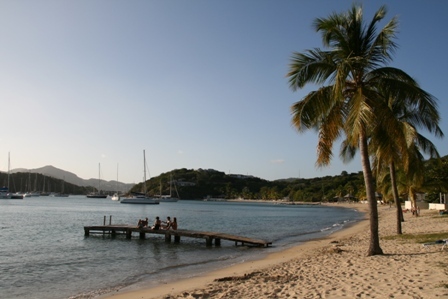 There are very few marinas in the Caribbean due to the potential effects of the hurricane season – so its anchor in the bag and take the dinghy to shore. 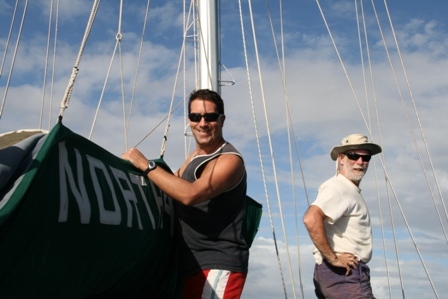 Early the next morning (29 Feb), Jarlath started the engine early and left St Pierre. Once out of the shelter of the island, the wind hit, the sails were unfurled and we were bounced around like kids on a trampoline! Cathal and I, yet to find our sealegs, suffered a lot on this leg…a necessary evil! Once in the lee of Domenica things were a lot more pleasant; the sun came out and conversation resumed! Domenica is a mountainous island, it is very green and prides itself on being an eco-island. This kind of reads ‘havent done much with it’! It is formerly a British colony, independent now. We anchored in Roseau the capital, and went ashore to investigate. Cruise liners stop here, so the last draggles of high heeled tourists were leaving as we arrived. The cruise ships dominate the tiny town, but bring very welcome revenue to an otherwise poor place. We found a great hotel with attendant happy hour to spend the evening, and were well entertained by a fantatic local band. We headed north on 1 March for Portsmouth, in Prince Rupert Bay in the north of Domenica. Locals in small boats often offer services while you are coming in to harbour. The lad at this place took his job seriously and tailed us for at least 3 miles! There was nearly a fight the next morning when we went with another guide up the Indian River….its not easy for these guys to make a living. 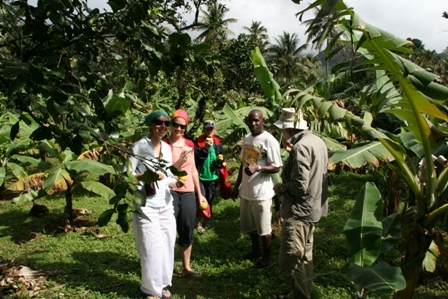 The river trip was interesting, it included some fiery rum at the Jungle Bar and a walk through a plantation full of grapefruit, breadfruit, mango and other tropical delicacies. We strolled back through the town. 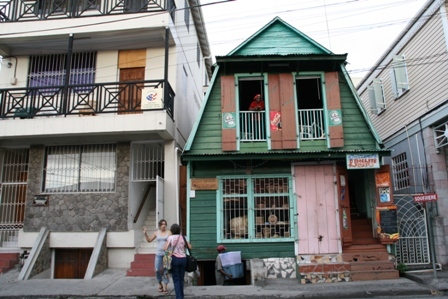 It is quite poor, but pretty in a Creole way. As it was Sunday, everything was closed; Everyone was at church, singing wonderful gospel songs. We could hear them from up the river, it was lovely to see their celebration up close. 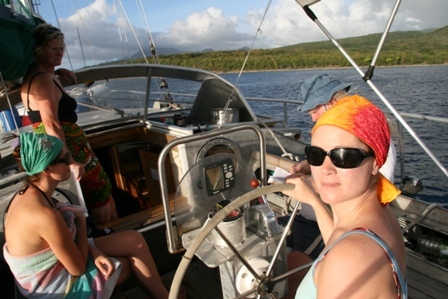 We left later that day for Les Saintes, a pleasant 5 hour sail (have sealegs now!). 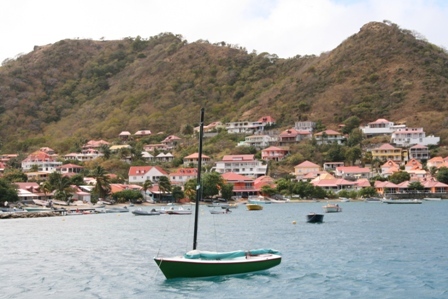 Les Saintes is a collection of small volcanic islands, part of the French Caribbean Islands. It proved to be quite a contrast to Domenica. 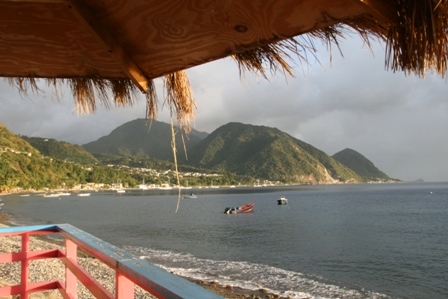 Les Saintes, like Martinique, is actually a department of France. This means French car registrations, baguettes, and European prices (which contrasts greatly with Domenica). When moving between the West Indies islands you have to carry a myriad of currency with you – euro, dollars and East Caribbean dollars! It gets a bit complex when moving to a new island every second day or so! 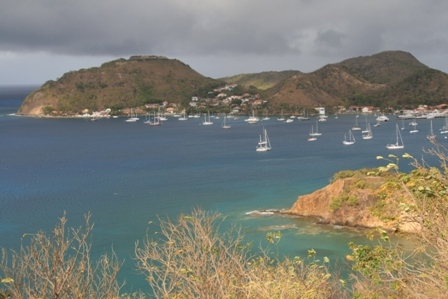 We anchored off Bourg les Saintes, a very pretty town full of gingerbread houses and nice cafes. Jarlath immediately decreed to spend 2 nights here, and we were all delighted. The free day here was spent relaxing and exploring. We enjoyed nice proper coffee, and took a 3K walk to a beach called Pain de Sucre (sugarloaf) where there was excellent snorkelling. The weather was a little against us, and there were squally showers all day. Bourg les Saintes was lively enough during the day, but when a bit of craic was looked for after dinner by the lads, pints were difficult to find!! Not all sun and games! A leisurely start the next morning and a short half day sail brought us to Bas de Fort in Guadeloupe, another French Caribbean island. Guadeloupe is big, and shaped like a butterfly. 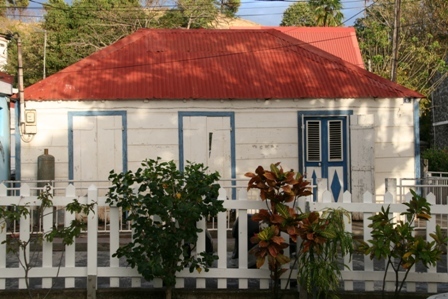 It has two main sections – Basse Terre and Grande Terre, named for the winds that each get – low and big respectively. They are separated at the “body” of the butterfly by a narrow channel. The navigators on board decided to take on the challenge of going through the channel. More about that later! We docked at the marina – the poshest place yet! We’ve now gone from anchoring off a poor town in Domenica to living it up in a marina with wifi access and chic shops. We managed to find a non-extortionate place to eat – not easy! 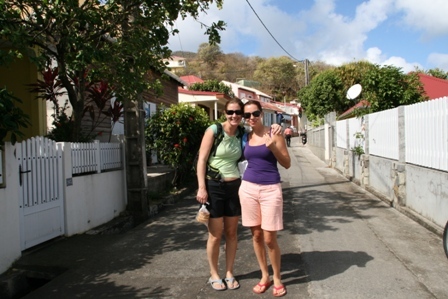 Cathal and I spent the next day visiting Sainte-Anne, a town 16K up the coast. We took the local bus. 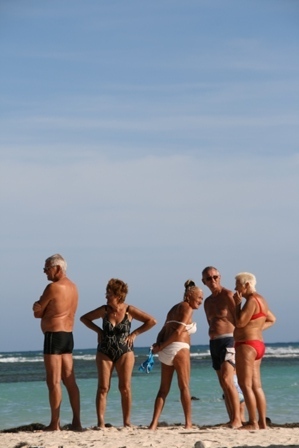 Until we stepped on the bus, we would have thought that Guadeloupe was populated by French white people. However, the real population became apparent on the bus – all of African origin. French people actually only make up 3% of the population. We spent a lovely afternoon soaking up the sun at Sainte-Anne. Aqua blue sea and white sand…you get the picture! Ladies were selling icecream made the old fashioned way – in a barrel with ice around it. A not-so-early night was followed by a very early start on Thursday (6th March). In order to get through the Riviere Salee (salty river) between the two islands of Guadeloupe, we had to leave the marina at 4am. The two bridges linking the islands open once a day only – at 5am! Jarlath and Donagh skilfully navigated us up the narrow channel through the mangroves and we held our position waiting for the bridges to open. It was a tricky manouvre considering the current and breeze, but we got through with no problems and continued the passage back out to more open sea the other side of the channel. Sunrise was missed by most as we returned to our bunks for a couple of hours, then we continued sailing to a small fishing village on the north tip of the easterly island called Port Louis. 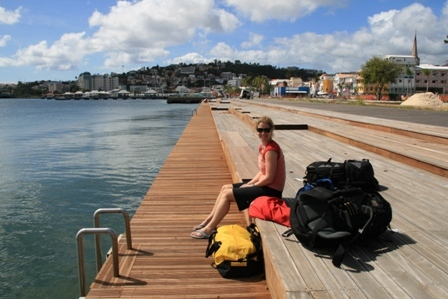 Port Louis has a small fishing harbour, set in beautiful aquamarine waters. As Northabout is shallow in the water, we were able to get into the harbour and to the amusement of curious onlookers, tie up beside all the tiny fishing boats! Port Louis is a lovely quiet Caribbean town. 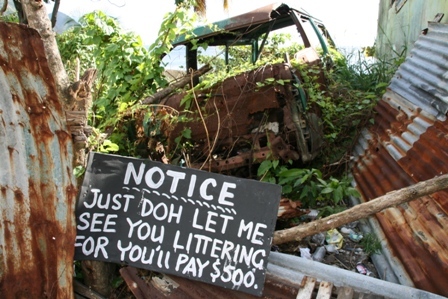 The locals were really friendly in a nice way – ie not looking for your dollars. Cathal and Paddy went diving for the afternoon – they had a great experience. The beach was the place for me! 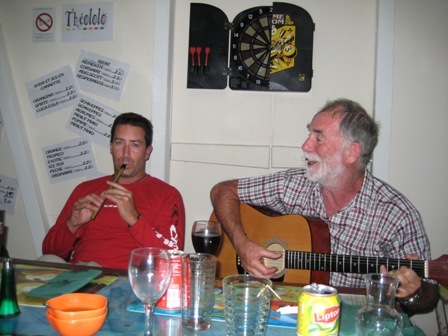 We discovered a nice French-run cafe for dinner, it proved a winner as the owner had a couple of guitars. A singsong ensued, which proved a draw for the locals. Donagh procured an entire bottle of rum and made his way through a sizeable amount!! 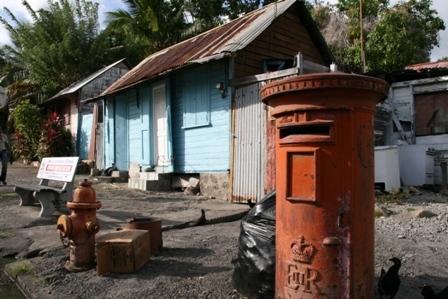 Friday we headed onwards to our final destination – English Harbour in Antigua. It was a 7 hour crossing, albeit a very pleasant one with a beam wind taking us at a good pace to our destination. Several of our number slept for most of the journey (rum and singing possibly to blame!). We arrived at 3pm to Nelson’s Dockyard, and over VHF procured a mooring. Getting the boat in Stern-first proved quite a manouvre and attracted more than a few onlookers! The people in boats on either side sped up and down their boats carrying fenders to avoid the effects of a crash! Nelson’s Dockyard is a beautiful place, set in a perfect natural harbour. It is almost landlocked, with a narrow but deep entrance. The dockyard was a working yard in Georgian times, and has now been elegantly restored to its former glory. Some of the buildings reflect the old uses. We had the weekend to explore the area. 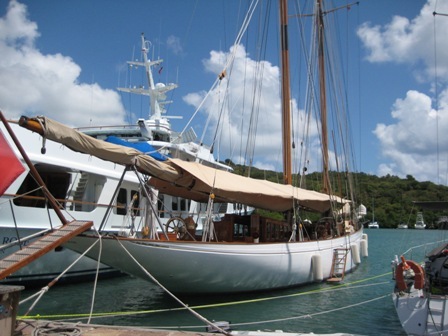 The yachts in the dockyard are all incredible – beautifully maintained boats of all sizes (mostly large!) and age. Over the hill in Falmouth Harbour we found even bigger boats! 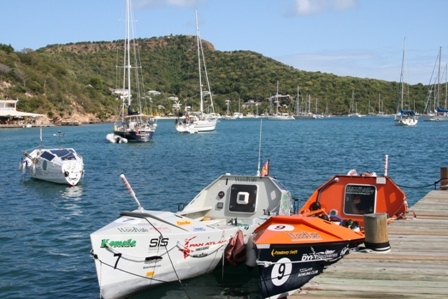 English Harbour hosts Antigua Race Week, and is the finishing harbour for the Atlantic rowing race (the one that Ciaran Lewis and Gearoid Towey competed in) and for the ARC Atlantic crossing. I can’t imagine a more perfect place to finish a gruelling course, particularly for the rowers! Ocean Rowing boats – abandoned! A big night out for Monica and I (thanks to Antigua Smile cocktails) chaperoned by Donagh led to a very quiet Saturday! However we got to enjoy the sun and our surroundings. 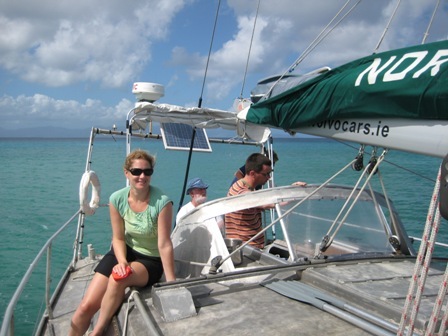 A big thankyou to Jarlath, skipper of Northabout, for giving us the opportunity to experience Caribbean cruising. 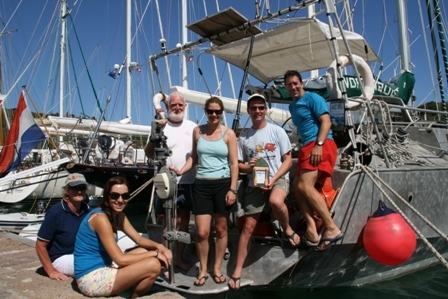 A big thanks to all the other crew members for being such good company – Paddy, Anne, Donagh and Monika. We look forward to joining the Westport gang for some west-coast sailing when we get back to Ireland! Looks fantastic Jane….very jealous!! hope you got some good wind out there in the carriban….and that Cathal enjoyed the step up from ‘Lazers’in Dun Laoghaire Bay! Looks and sounds like you both enjoyed your Caribbean cruises. The pictures look great. It’s great that you both got to meet up with a few familiar faces. Looking forward to reading about your trip to Cuba.